Are you interested in becoming a partner with Solar Transport? 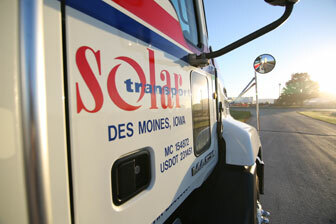 Solar can provide flexible same day delivery service as a backup to act as reinforcement for your capacity needs when third-party carrier assistance is needed. Product integrity, security and transportation safety are at the core of what we do. We are transparent in our dealings, and always work to do the right thing. We serve you with the latest inventory management techniques, fuel monitoring software and a modern fleet of delivery trucks. We select the best, train them well and treat them right. With our passion, integrity and associates-first approach, we deliver 24/7/365 individualized customer care.